Eezham Tamils should not fall prey to the advocacy coming from the Western countries that prod them into the roadmap of unworkable transitional justice in the island, Jaffna-based Senior Lawyer and Political Analyst S.A. Jothilingam told TamilNet on Tuesday. The Tamils have almost lost their trust in the UN institutions after witnessing the events unfolding at the UN Human Rights Council in Geneva. If the UN system, also politically siding with the political establishment, could not deliver justice to the crimes committed against the Tamils in the island, it would not be able to resolve the political conflicts anywhere else, he reiterated. The Western states involved in the geopolitical race against China want to make concessions to the UNP government. In their greed for securing strategic interests, they are sacrificing the justice owed to Tamils, he said. 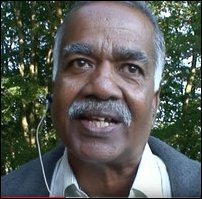 It is not a matter of certain governments of the unitary State presenting themselves as genocidal against Tamils, Mr Jothilingam said. The entire ‘Sri Lankan’ State system is structurally and institutionally genocidal in nature. The domestic courts that branch from this state system are ethnocentric in character. They can only incline towards the genocidal state. In such a system, it will never be possible to achieve anything through transitional justice, he said. The hybrid system would not work under this system. The state structure of ‘Sri Lanka’ does not provide a space for the existence of hybrid courts: even if SL representatives agree to hybrid courts to appease the West, the very same people are able to escape their obligations by simply citing the unitary constitution when they return to the island. “Foreign judges could not be legally appointed without a two-thirds majority from Parliament”, is just an example of the kind of things they will go on record to state, he added. When the SL State was conducting a genocidal war, deploying foreign pilots and military experts to operate radars, however, it did not need such approval from its Parliament, he emphasised. This is the way the ‘Sri Lankan’ State structure exists – as a weapon to wage genocide of Tamils and as a tool to deviate the course of justice owed. He highlighted that it cannot be expected that a true justice seeking arrangement for the Tamils will evolve from the UN system so long as it succumbs to the geopolitical interests of international stakeholders. The UN should recognise its flawed political arena and accept that if it could not deliver justice to the Tamils, it would not be able to deliver justice to victims of crimes anywhere else, he stressed. The Tamils should, therefore, remain firm in demanding a true international justice and accountability process to protracted genocide, the senior lawyer said.